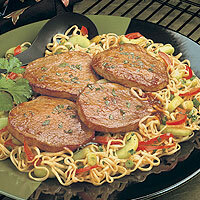 Soybeans, garlic, and chiles in the hoisin sauce contribute to the sweet and spicy taste of these steaks. Combine water, hoisin sauce and vinegar in small bowl. Heat large nonstick skillet over medium-high heat until hot. Brush skillet with oil. Add cucumber, bell pepper and green onions; stir-fry 1 minute. Stir in noodles, 1/2 of cilantro and 1/2 of hoisin mixture. Remove. Heat same skillet over medium-high heat until hot. Place beef steaks in skillet; cook 2 to 4 minutes, turning once. Do not overcook. Add remaining hoisin mixture; turn steaks to coat. Serve over noodles. Sprinkle with remaining cilantro.